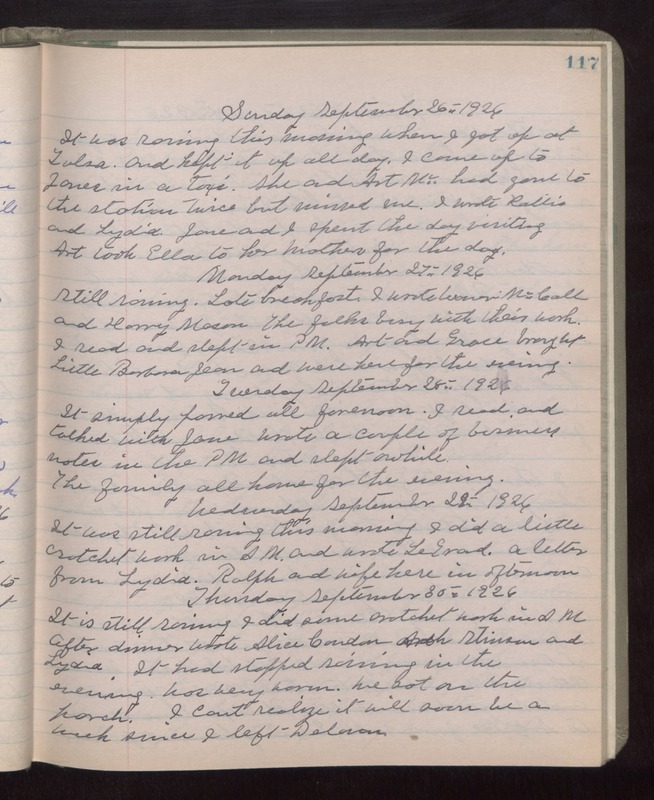 Sunday September 26th 1926 It was raining this morning when I got up at Tulsa and kept it up all day. I came up to Janes in a taxi. She and Art Mc--- had gone to the station twice but missed me. I wrote Hattie and Lydia. Jane and I spent the day visiting. Art took Ella to her Mothers for the day. Monday September 27th 1926 Still raining. Late breakfast. I wrote Warner McCall and Harry Mason. The folks busy with their work. I read and slept in PM. Art and Grace brought Little Barbara Jean and were here for the evening. Tuesday September 28th 1926 It simply passed all forenoon. I read and talked with Jane. Wrote a couple of business notes in the PM and slept awhile. The family all home for the evening. Wednesday September 29th 1926 It was still raining this morning. I did a little crotchet work in AM and wrote LeGrand. A letter from Lydia. Ralph and wife here in afternoon. Thursday September 30th 1926 It is still raining. I did some crotchet work in AM. After dinner wrote Alice Condon. Arth Stinson and Lydia. It had stopped raining in the evening. Was very warm. We sat on the porch. I cant realize it will soon be a week since I left Delavan.